If a cake has vegetables in it, can you consider it a meal? I’d like to think so! 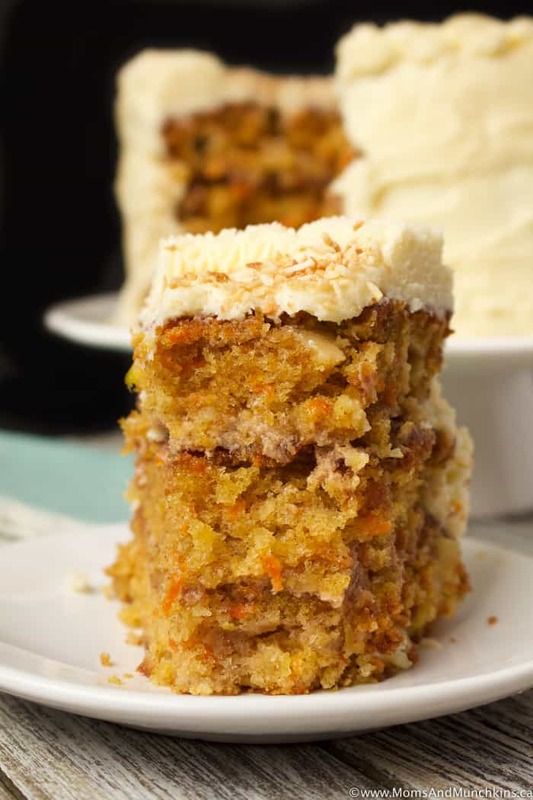 This Carrot Cake with Cinnamon Cream Cheese Filling is highly addictive. I started off with a small piece to simply test the recipe but then I kept going. Do you ever take a small piece of cake but then keep cutting little slivers off the leftover cake to simply even out the remaining pieces? No? Okay, it’s just me then. I had planned on giving 3/4 of the cake to my boyfriend’s boys but by the time it got there, it was about 1/2 of a cake. Oops. I’ll make it up to them today with some cookies…after I taste test those too, of course. Easter is sneaking up quickly on us – do you have your recipes and egg decorating ideas ready yet? I recently read an article about decorating Easter eggs with temporary tattoos. When I read that I thought “That’s brilliant – why didn’t I think of that? !” so we’ve been stocking up on temporary tattoos for our egg decorating this year. I don’t think we’ll have company for Easter this year but I’m still planning on French Toast for brunch (I’ve been waiting for a special occasion to try these French Toast Fingers). 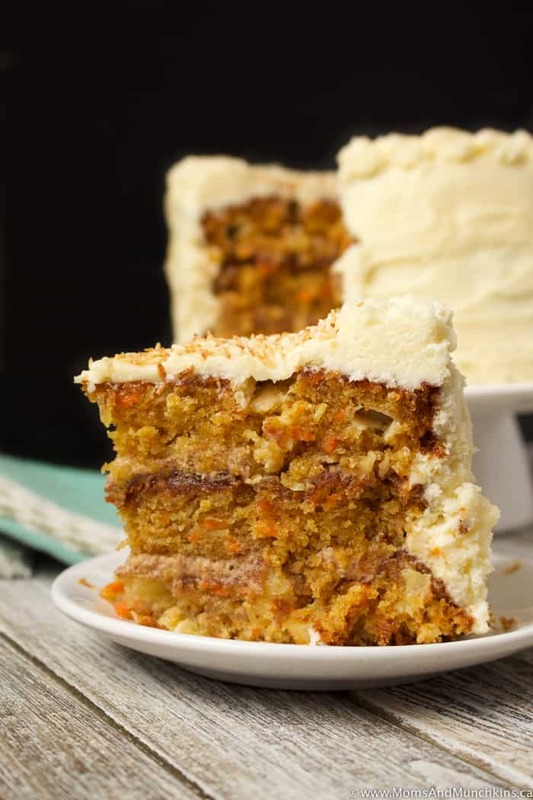 I haven’t decided on supper yet but I’m sure we’ll be finishing the day with slices of carrot cake. Did you know that eggs are one of natures most nutritious foods? They are an excellent source of protein and essential nutrients. So when you’re buying eggs for decorating, pick up extras for eating! With Easter coming up, I decided to try a new carrot cake recipe. After all, carrots are the Easter Bunny’s favourite food so you kinda have to make one at Easter, right? I love cream cheese icing but I wanted to try something a bit different inside the cake this time so I filled the cake with a cinnamon bun cream cheese filling – the same filling I use for my Cinnamon Bun Crepes. Oh my goodness, it was good. This cake is really moist so you'll want to grease the baking pans with a cooking spray that has flour in it. In a large bowl, beat together vegetable oil, sugar and eggs. In a separate bowl, combine flour, baking soda, baking powder, salt and cinnamon. Stir together well then beat into the wet ingredients until well combined. This will be a thick batter but that's okay! Stir in grated carrots, 1 cup of coconut, vanilla and pineapple with juice. Stir until well combined. Pour into greased pans (two 9-inch pans). Bake for 35-40 minutes or until a toothpick inserted in the middle comes out clean. You could use three 8-inch pans instead but then you'd want to reduce the baking time to 25-30 minutes. Beat butter and cream cheese on medium speed until well mixed. Add powdered sugar and beat until creamy. Add vanilla and beat until mixed well. Add powdered sugar, brown sugar, white sugar and cinnamon and beat until creamy (no more lumps). 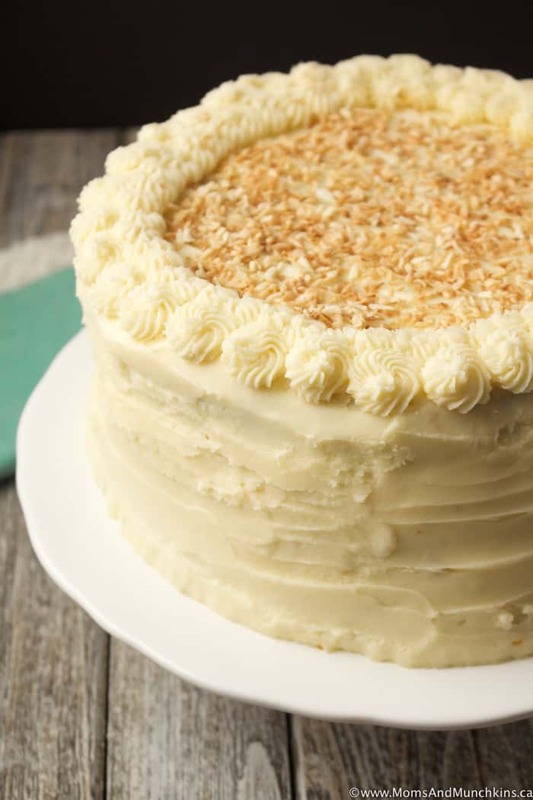 Once the cakes have cooled completely, add the cinnamon cream cheese filling to the top of the bottom cake layer, put the top cake layer over the bottom cake layer cake and then ice the top and sides of the cake with the cream cheese icing. 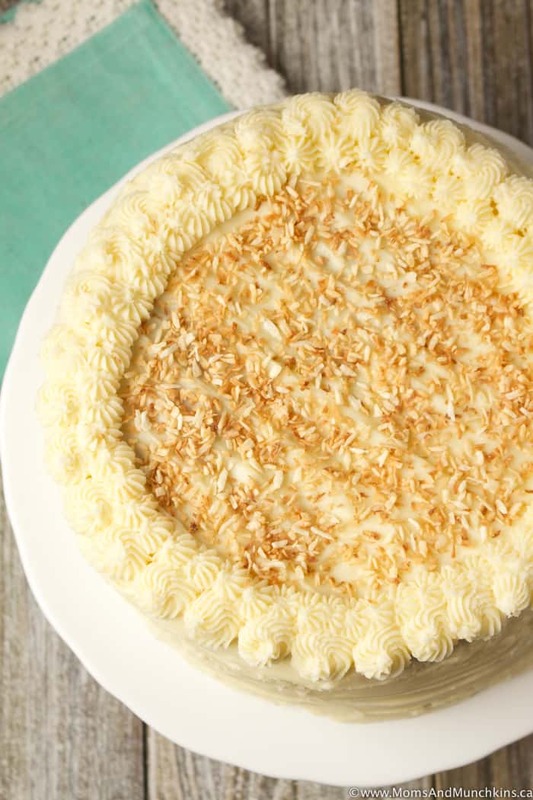 Optional: Use the remaining ½ cup of coconut as topping on the cake. I lightly toasted mine in a frying pan (just make sure you cool it before adding it to the top of the cake). Visit our Recipes page for more delicious ideas and our Easter page for more fun holiday ideas like free printables, party ideas, scavenger hunt ideas and more! Gorgeous post!!! Perfect Easter cake!! Your cake looks amazing! I love cinnamon and can’t wait to try your recipe. Thank you, Theresa! I hope you enjoy it as much as we did. Wow. these look amazing. I will see how I can do it dairy free.